Even in the rain, the park was beautiful. 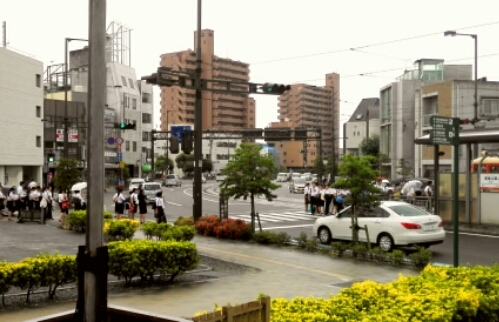 It was a gray day, had been raining for hours, everything in Matsuyama looked grey and bleak. After days with sun and clear skies, the weather did affect my impressions of Matsuyama, did dampen my enthusiasm. I was on my way to Matsuyama Castle after a visit to Dogo Onsen. I had just had lunch at a local brewery pub. I thought about taking a tram to the castle to get out of the rain, but opted to walk. It wasn’t raining too bad, and I had an umbrella to hide under. Not far from the onsen I passed Dogo Park, decided to take a look. I like Japanese parks. I find them to be quite areas, small havens, in usually loud cities. 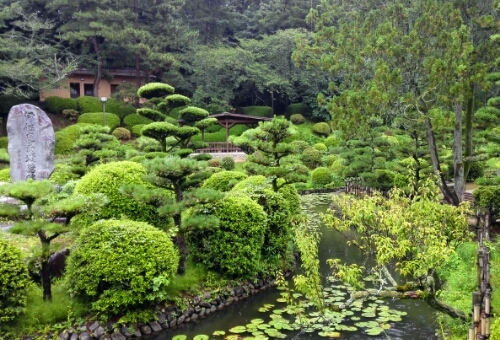 A park is usually never far away, and if you get tired of the noise and throng of people on the streets of Japanese cities, a Japanese garden can give a moment of solitude and serenity. I had recently been to Koraku Park in Okayama which truly was a quiet gem, one of the three most beautiful parks in Japan it is called. Now, Matsuyama wasn’t a particularly loud city, I found it very quiet in fact, but I still thought the park worth to take a look at. Japanese parks are not only quiet, they are beautiful too. A small pond, lilies floating on the water. 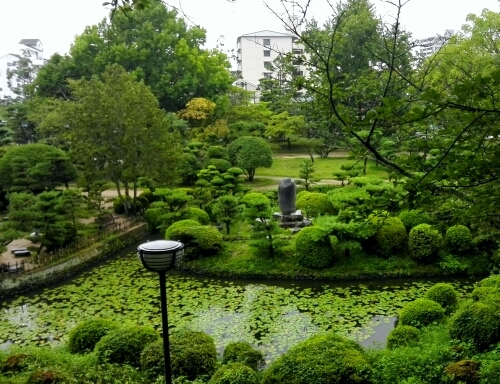 Green bushes and small trees around the pond, perfectly shaped, perfectly placed. I stood for a long time to take it all in. Still so green on this grey, rainy day. In such contrast to the concrete jungle outside the park. I took a path through the woods, passed a receptable to a hot spring used until the current Dogo Onsen was built, followed the road further. I found myself on a small hill with a great view of the park. As I left the park I regretted it being rainy, I would have loved to seen the park in sunshine. Then I saw the line for the tram outside the park, how organised the Japanese were. About a hundred people had lined up in a very orderly line. It even went across a pedestrian crossing. That sight made me laugh. Dogo Koen is located only a few hundred meters from Dogo Onsen in Matsuyama, just across the road from Dogokoen Tram Station, servicing the Iyo Tetsudo Hommachi Line, Matsumayamaekimae Line and the Shieki Line. If visiting Dogo Onsen, why not stop at Dogo Koen as well? This entry was posted in Uncategorized and tagged Japanese garden, matsuyama, public park on April 17, 2017 by Traveltorgeir. I really like the way the park is designed, with the beautiful architecture if I can call it like that. You can see it has been designed with “zen” in the mind. Even in the rain it still looks peaceful and beautiful and definitely a great place to relax from the busy city. 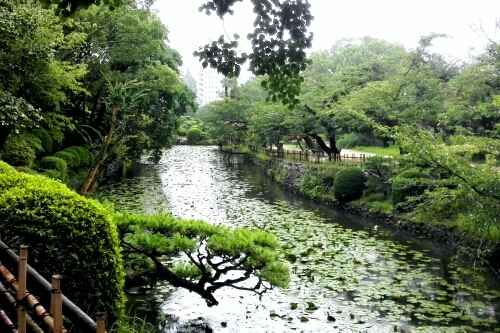 Like you, I like Japanese parks and gardens. They offer respite from the busy city atmosphere. It might have been rainy but as you said, the park is still beautiful. It then maybe gives you a reason to come back here on a sun shiny day for a different experience. I have heard a lot about Japanese parks and I am glad you showed me one virtually. Away from the din of the city, I am sure they make a great place to have your silent moments. Anything about Japan is so attractive. I recently saw a Japanese movie and was intrigued to visit Japan. I have never heard of Matsuyama. I would love to explore Matsuyama along with other places in Japan. Mount Fuji is high on my to do. The park looks clean and beautifully-designed. 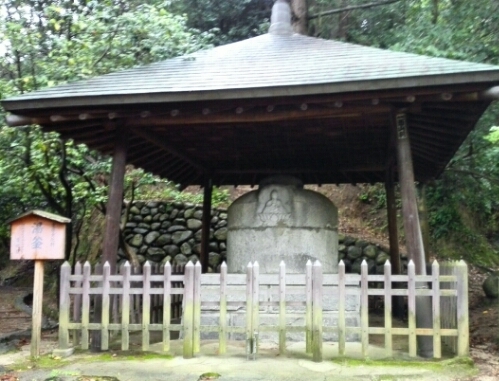 It symbolizes harmony and zen. I’d love to visit the parks in Japan someday. Japan is amazing and when we went we definitely did not enjoy enough its parks and greeneries. Your pictures make us feel like we missed out big time! If i have one dream destination right now is Japan! It has been in my dreams for years and every time I read a post about it or see some pictures -even in the rain – I fall in love with it even more. And what about this gorgeous park? It’s truly stunning and despite the grey sky the green is really coming out of the pictures! I love the idea of having parks dispersed throughout the city, seems like the perfect break from the stressors of everyday life. Thanks for sharing!